Everyone loves Thursday, right? You've made it over the hump, and the weekend is in sight. If you're anything like me, though, you've been in stilts all week, and your feet could use a reprieve. A comfy pair of wedges with a moderate heel height is your best bet. If you opt for the new Calypso Wedge from TOMS Shoes, you'll treat a child in need to a pair of shoes too. (You know they donate a pair for every pair purchased, right?) Since Americana, Nautical themes and preppy inspirations are all huge trends this summer (and espadrilles are a seasonal staple), they'll make a great addition to your shoe closet. During your post-work cavorts this evening, you'll want to sip something fun. Try a Leblon Madras. 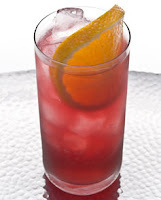 With its preppy name and combination of Leblon Cachaca, orange juice and cranberry juice it's a great cocktail pairing for your snazzy shoes. This drink is what I like to call a sneak-up, though, so pay attention to how many you consume. It tastes so yummy that you may forget it contains alcohol, but eventually it'll hit you. Besides, you don't want to spill a red drink on light-colored fabric shoes.